Take Hwy 90 West toward Houma/Boutte. 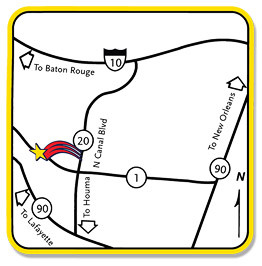 Continue until exit #215A Hwy 1 to Thibodaux ~17 miles. Take right onto HWY 1/Saint Mary St. for ~0.8 miles. Economy Inn is on left. From I-10, exit #194 Hwy 641 South. Continue straight into Hwy 3213 South over bridge. Take right on Hwy 3127. Turn left on Hwy 20, go ~17 miles. Turn right onto Hwy 1 for ~0.4 miles. Take Hwy 90 E for ~63 miles. Take exit 202 Hwy 24 towards Thibodaux. Continue straight into Hwy 20 for ~6 miles. Hwy 20 turns into Canal Blvd in Thibodaux. Turn left onto Hwy 1 for ~0.4 miles.